Controls, large and small strongyles, pinworms, and roundworms. 7.5 mg/kg (3.4 mg/lb) bodyweight daily for five (5) consecutive days. 15 mg/kg (6.8 mg/lb) bodyweight daily for five (5) consecutive days. This treatment is not necessary for foals to take. This treatment eliminates encysted small strongyle. Consult your veterinarian for a control program to meet your specific needs. Controls Tapeworms and infestations due to adult and immature roundworms and lungworms and bots. Recommended dosage is is 20mg per 100kg (220lb) bodyweight. Use one (1) sachet per 300kg (660lb) of your horses bodyweight. 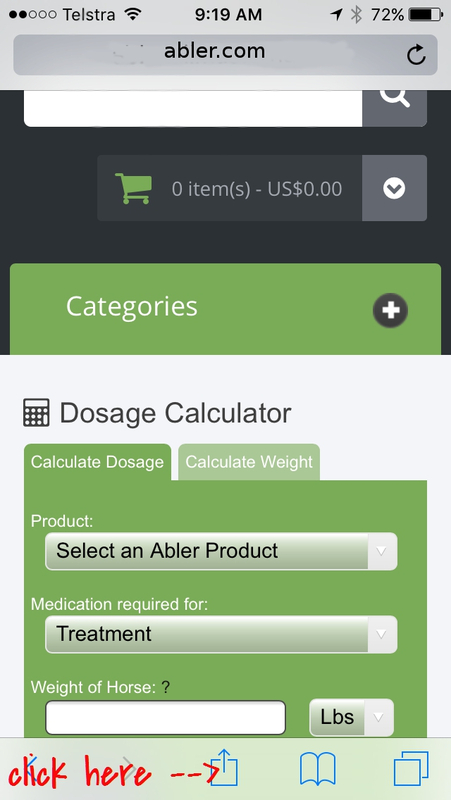 Our Abler Dosage Calculator is available to assist you. Controls Tapeworms and infestations due to adult and immature roundworms and lungworms. Recommended dosage is 145mg per 100kg (220lb) bodyweight. Simply use the required number of sachets based on your horse's weight. The Abler Dosage Calculator is available to assist you. Day 1: Recommended dosage is 8.8mg/kg (3.99mg/lb) of your horses bodyweight. Days 2 -5: Recommended dosage is 4.4mg/kg (1.99mg/lb) of your horses bodyweight. Ponies: Refer Veterinarian for recommended dosage. 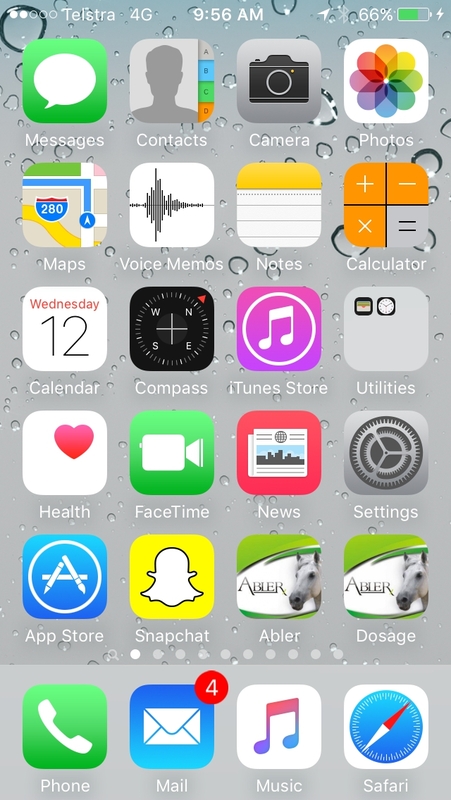 Launch the Safari browser on Apple’s iOS and navigate to the web page Dosage Calculator you want to add to your home screen. Tap the Share button on the browser’s toolbar — that’s the rectangle with an arrow pointing upward. It’s on the bar at the top of the screen on an iPad, and on the bar at the bottom of the screen on an iPhone or iPod Touch. 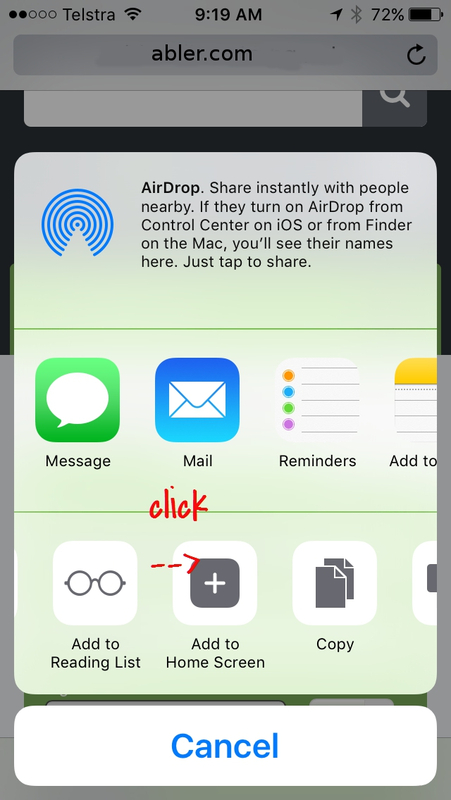 Tap the Add to Home Screen icon in the Share menu. Launch Chrome for Android and open the web page Dosage Calculator you want to pin to your home screen. Tap the menu button and tap 'Add to homescreen'. You’ll be able to enter a name for the shortcut and then Chrome will add it to your home screen.